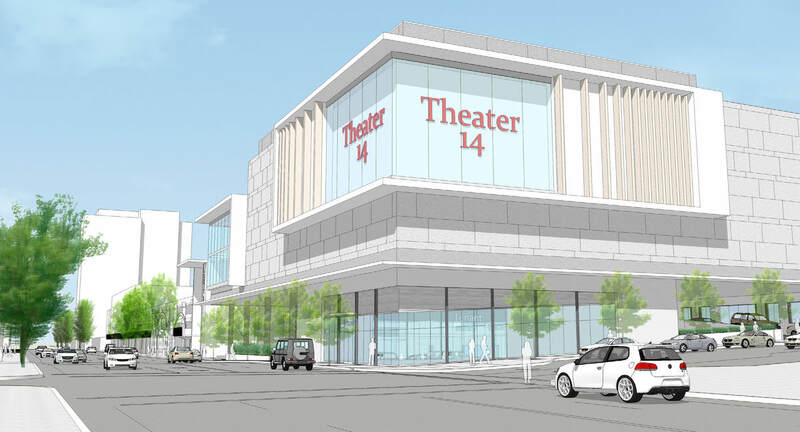 A revised concept for a theater addition to the Lloyd Center has been presented to the Design Commission. 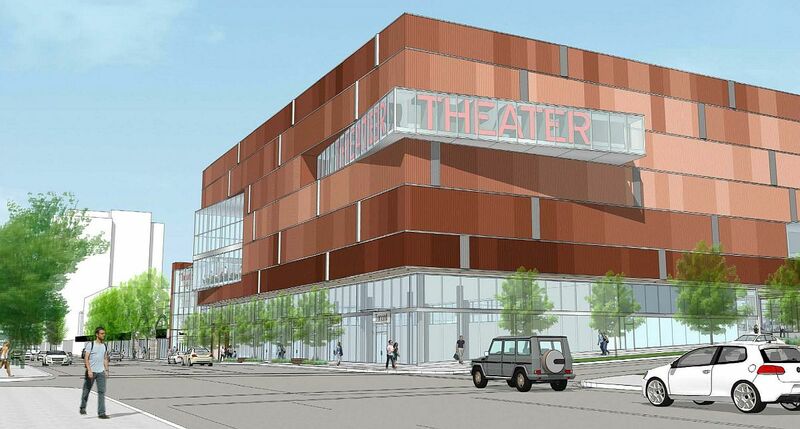 The proposal would include the construction of a new 70,000 sq ft theater building with 13 screens. The existing 145,000 sq ft east anchor building, most recently occupied by Sears, would be renovated for office use. The project is being designed by LDA Design Group of Burbank, California, with landscape architects 505 Design. 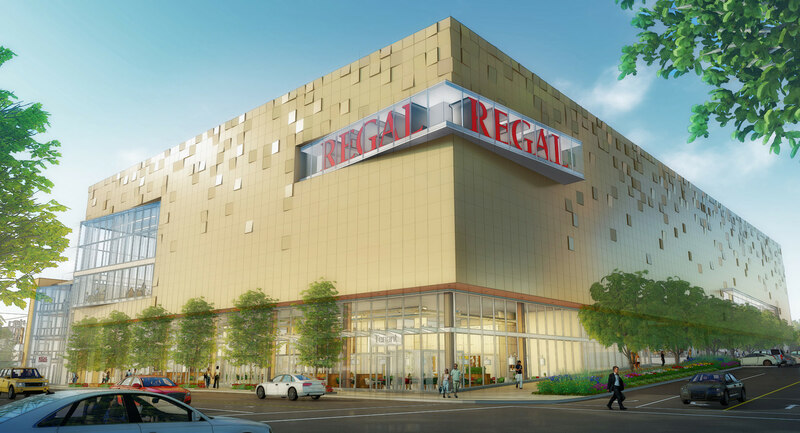 The Design Commission has approved an addition to east end of the Lloyd Center, which will include a 14 screen theater operated by Regal Cinemas. The project is being designed by LDA Design Group of Burbank, California, with landscape architects 505 Design. 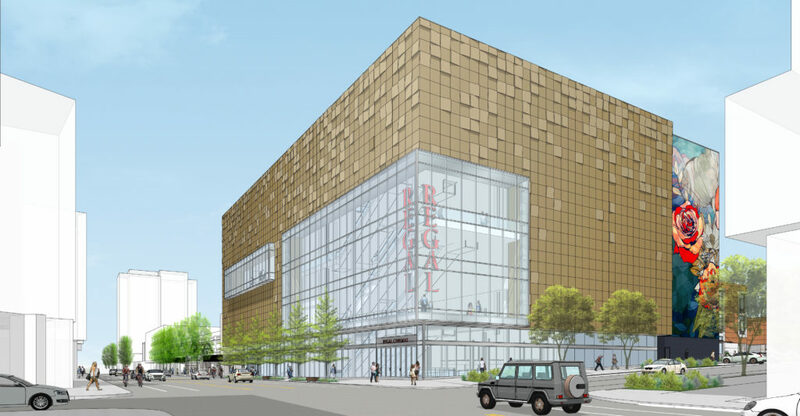 The project will include the renovation and remodel of the lower two floors of the east anchor building most recently occupied by Sears, for multi-tenant retail / office. 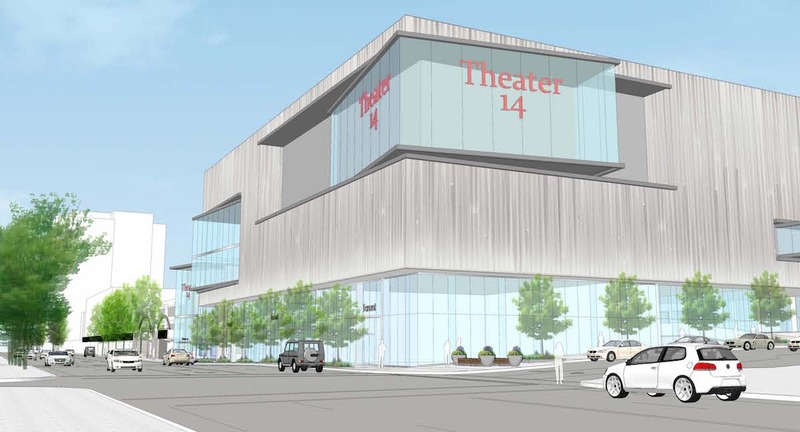 The new theater will be located at the third level. 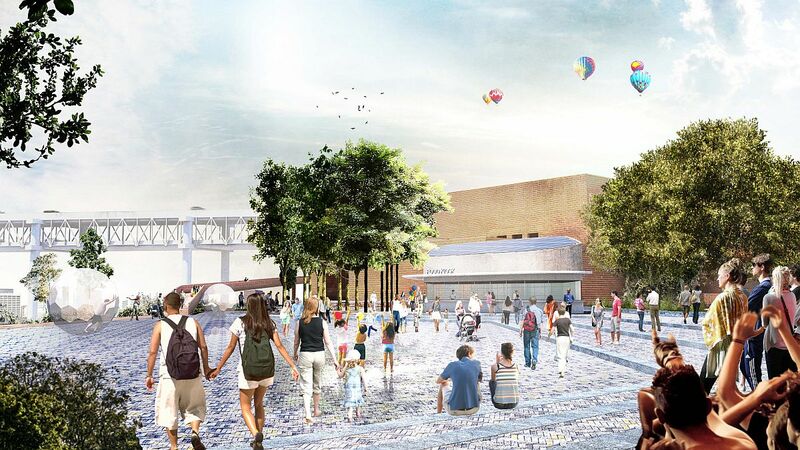 Image of a proposed “Tilikum Plaza”, which could be built as part of the OMSI Masterplan. The masterplan is currently being developed by Snøhetta and Mayer/Reed. Every week, the Bureau of Development Services publishes lists of Early Assistance applications, Land Use Reviews and Building Permits processed in the previous week. We publish the highlights. This post covers September 18th to September 24th, 2017. Current Code – Pre-App for a Type III South Waterfront (SOWA) Greenway and Design Review for the stretch of the SOWA Green way running from Gibbs St on the south to the Ross Island Bridge on the north. Oregon Museum of Science & Industry master plan. Current Code – New 5-story medical office building and 500 new parking spaces on 3 or 4 levels of below-grade parking. Project will be compliant with CUMP LU 11-183413 CU MS AD (HO 4120006). 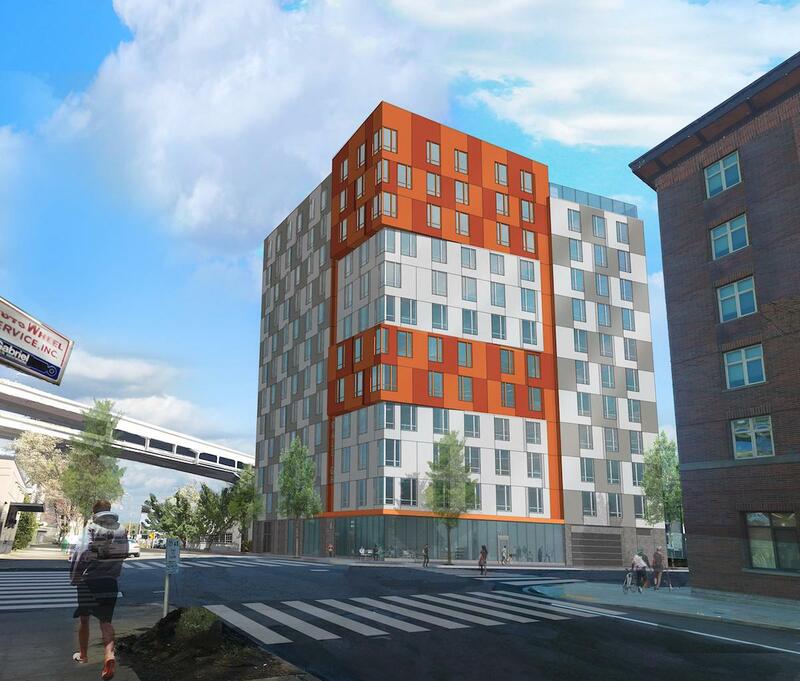 Current Code: New 3-story 9 unit multi-family residence with a rooftop deck, no off-street parking, on-site stormwater disposal in an RH zone with “d” overlay. The project has been designed to meet community design standards. They do need to confirm it works. New 3-story, 6 unit apartment building on lot with existing apartment building to include site utilities and landscaping, detached retaining wall, 100 square foot trash enclosure. New construction of 3 story 106,407 sf self storage facility with associated parking, utilities and landscape, interior trash room. ***separate mechanical permit required*** septic decommissioning required. Call for inspection 842. A proposed addition to east end of the Lloyd Center has returned in front of the Design Commission for a second Design Advice hearing. The project is being designed by LDA Design Group of Burbank, California, with landscape architects 505 Design. 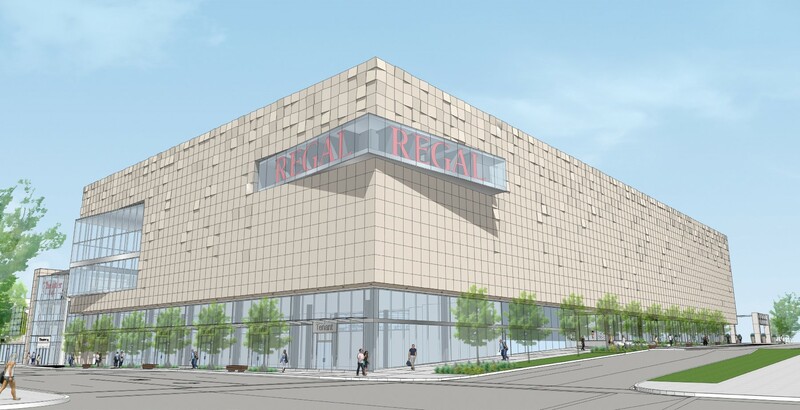 The project will include the renovation and remodel of the lower two floors of the east anchor building currently occupied by Sears, for multi-tenant retail / office. At the third level the building will include a new 14 screen theater.